If you don’t make prime rib, please make this. Just please. It’s SO delicious and simple and special and just lovely. Also, the other white meat! Always a fan. We’re actually having a discussion about what to do this year for Christmas. Usually we do Thanksgiving 2.0 with a smoked turkey instead of roasted, but this year, maybe because Thanksgiving was FIVE SECONDS AGO, we just aren’t sure. 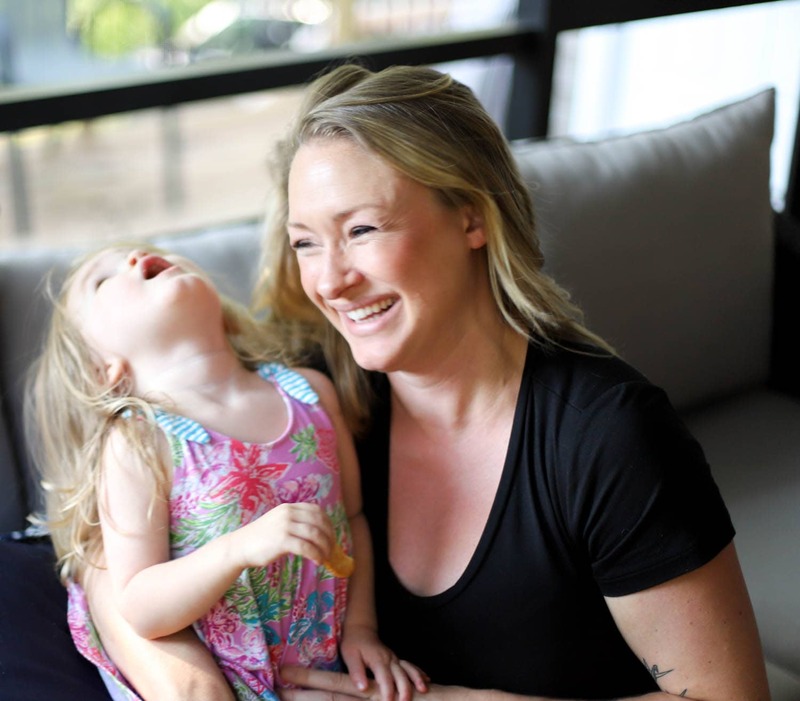 We talked about just having snack food all day, or maybe skipping breakfast (which my dad makes every year) and doing a big brunch around noon, or WHO KNOWS. What do you do? What should we do? 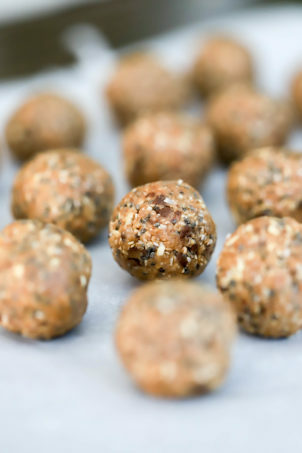 This is one idea I have for you – it kind of tastes like Christmas. We have a rosemary garlic salt that we rub sexily all over the pork, then we roast it until just bareeeeely pink (legit with pork now, it doesn’t have to be dry and gray!) and top it with its own cooking juices and pomegranate arils, which is a word that WordPress doesn’t know. Originally I had planned on making a gravy with the pan drippings, but the pork with the rosemary was so GOOD, that I decided a sauce wasn’t even worth it. This is huge, considering that I love condiments more than actual food 9 times out of 10. Srsly. 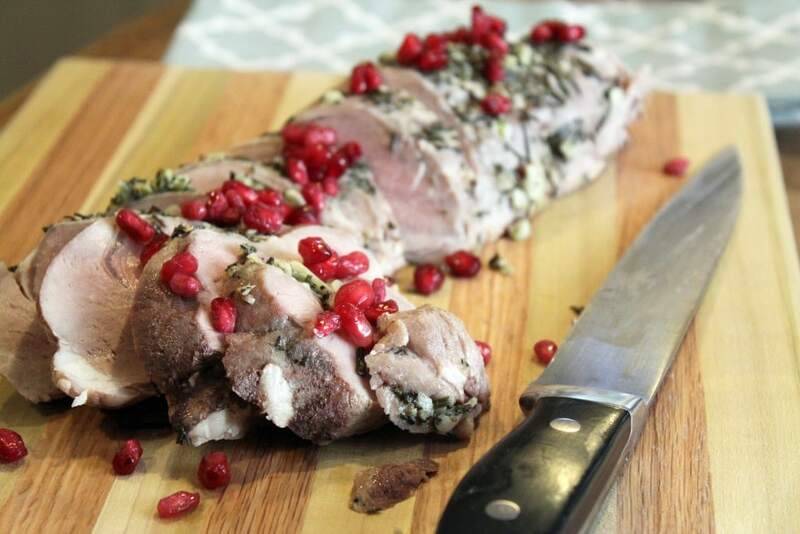 So, for this beauty you need pork tenderloin (packaged in twos usually – cook both! 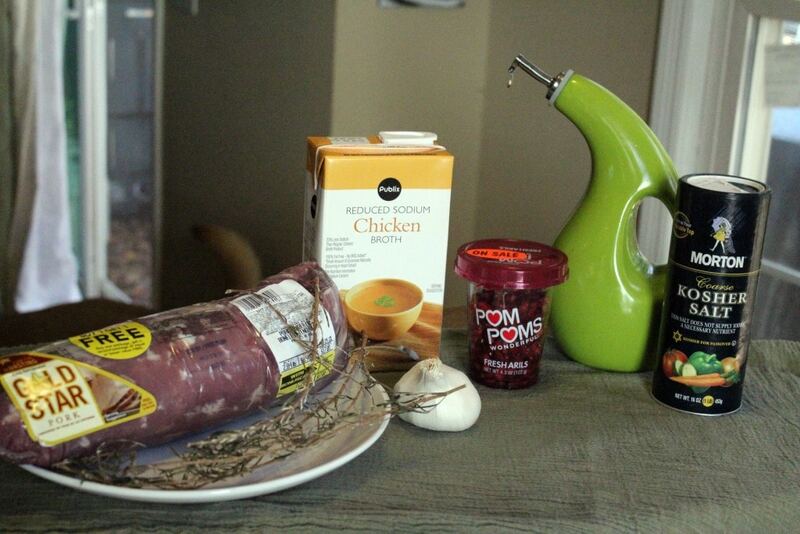 ), chicken or veg stock, olive oil, fresh rosemary, garlic, salt, and pomegranate arils! Feel free to extract your own from that strange fruit – these were on sale so I went the easy route. Also note the doggie tail in the background. Adorbs. And so clean. First, let’s get our pork rub going! Preheat the oven to 375F and grab the rosemary and garlic. 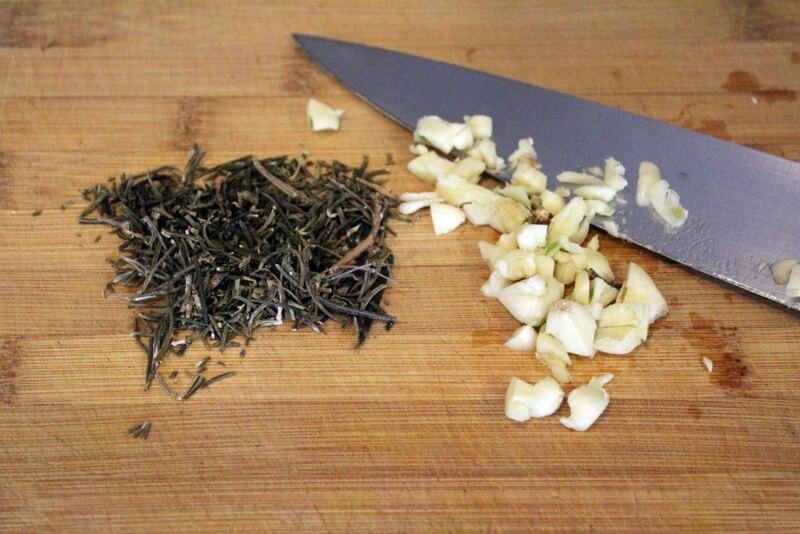 On a cutting board, strip the leaves from the rosemary – 1 sprig per tenderloin should be enough. Then, peel and roughly chop the garlic. We’ll mince it finely in a minute, so don’t take all damn day doing this. 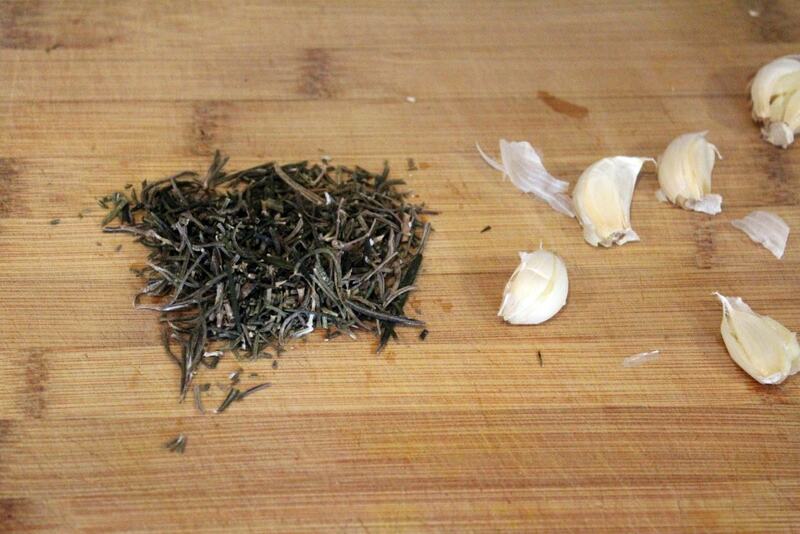 To the rosemary leaves and garlic, sprinkle on some salt – coarse if you have it, but regular is fine too. NOW we mince. 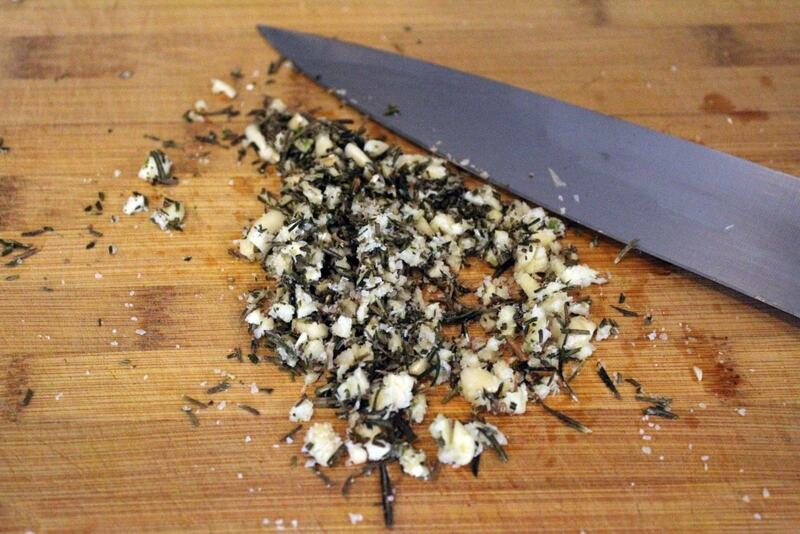 Run your knife through the salt/garlic/rosemary over and over again to combine it into kind of a paste. The smell here is something that is just…..ugh. Try not to lick the cutting board. Or do, whatever! Live your truth. Now, let’s get this pork ready to roast. 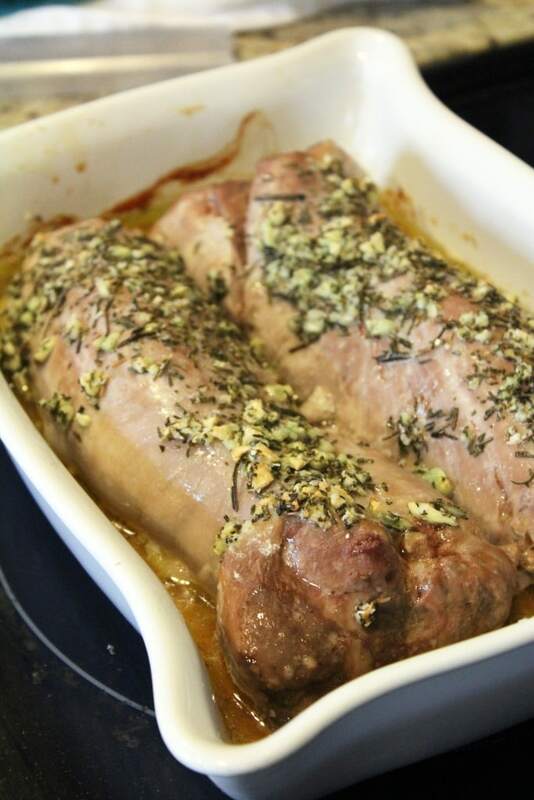 Place the pork in a baking dish, and rub it all over with the rosemary mixture. Add 1/2 cup of stock to the bottom of the pan, and drizzle top of the pork with olive oil. NOW WASH YOUR HANDS. Now, let’s roast the pork! 45 minutes or so depending on the size of your pork. We’re looking for an internal temperature of 150F for a light pink center. Check the pork after 30 minutes, then every 10 minutes after that until it’s done. Then let the pork rest for 15 – 30 minutes before you slice it. 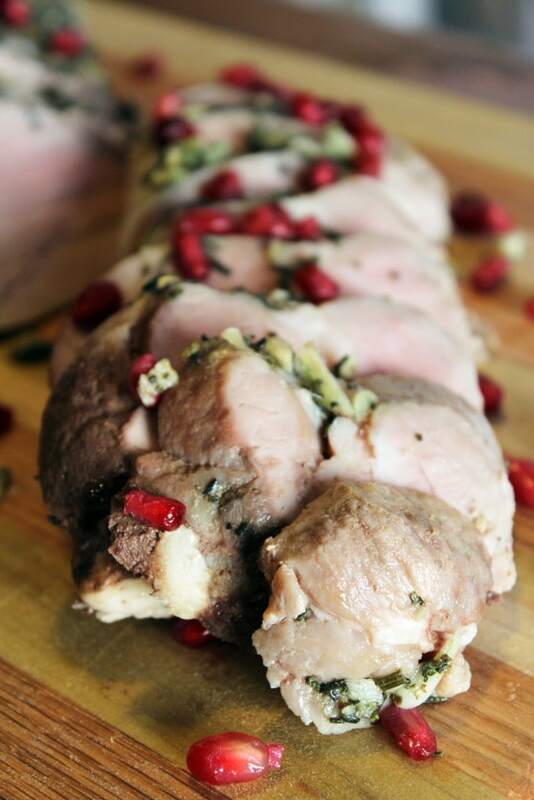 When you’re ready to eat, slice the pork into medallions, sprinkle it with the pomegranate, and eat. That’s IT, seriously. 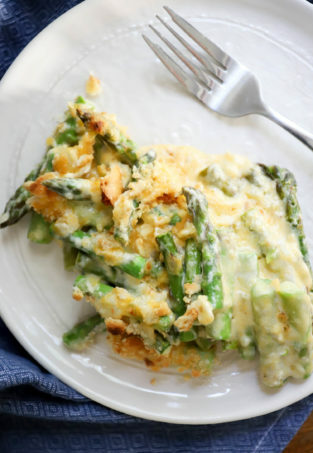 If you serve this with rice or something spoon some of the pan drippings on top – they’re wonderful. The deep flavor of the rosemary combined with the bright citrusy pomegranate is what really gets me with this. 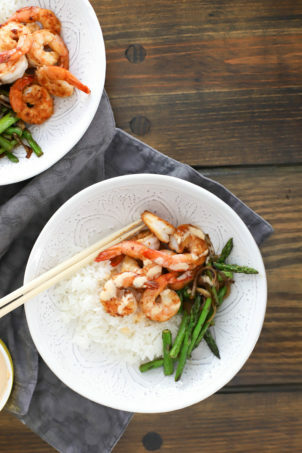 We totes might be able to incorporate this into our brunch on Christmas. What if we put it on sandwiches? Let’s try that. Preheat the oven to 375F. 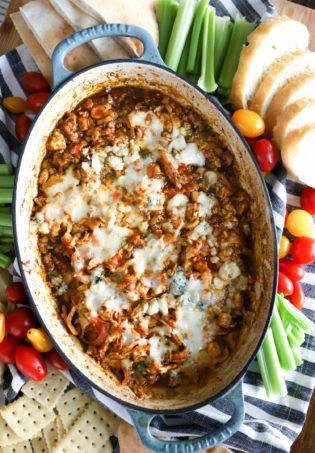 Place the pork in a baking dish. 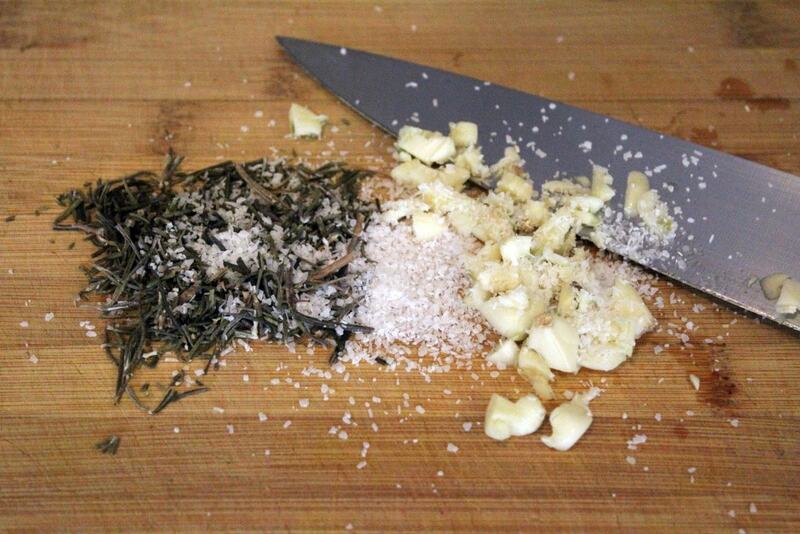 On a cutting board, mince the rosemary, garlic, and salt together to form a paste. Rub the rosemary mixture all over the pork. 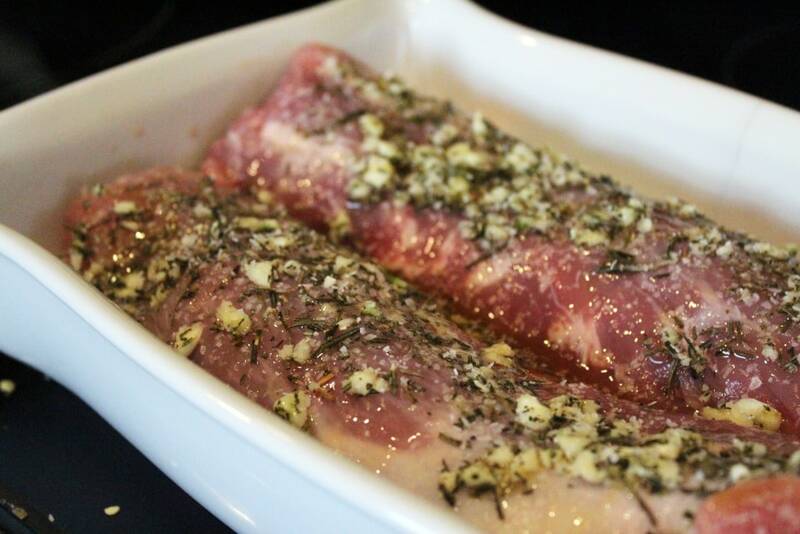 Pour the stock into the bottom of the baking dish, and drizzle the tenderloin with the olive oil. Roast for 30 - 45 minutes until an internal thermometer reads 150F. Tent the pork with foil and let rest for 15 - 30 minutes. 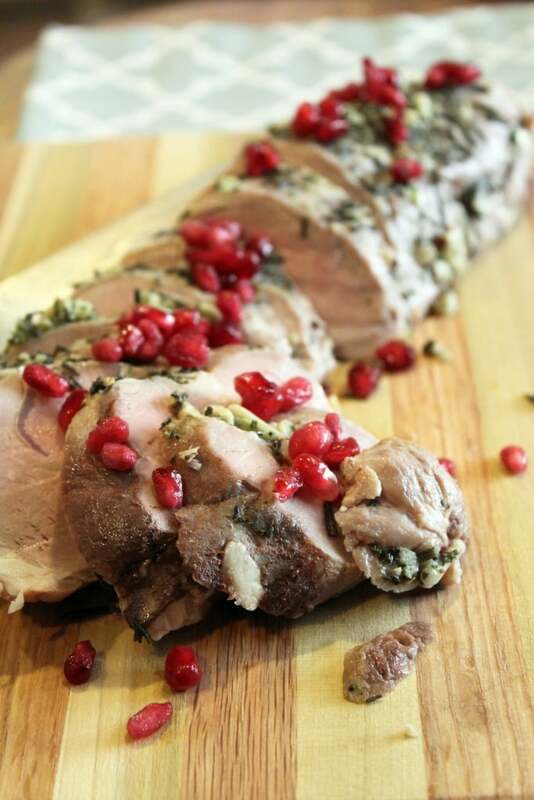 Slice into medallions, and sprinkle the pomegranate arils all over the pork before serving.